I'll grant you that from a national perspective in Week 13, the marquee matchups are Vikings at Falcons, Panthers at Saints, and Eagles at Seahawks. But what fun is writing the obvious? Take the playoffs out of the equation, and I'm not sure there's a game with more storylines than the otherwise putrid matchup between the 49ers and Bears. First, let's start with the 2018 NFL Draft. As things stand now, the 49ers (1-10) would pick second behind Cleveland and the Bears (3-8) would go seventh. So, the loser Sunday could be a big winner. And the higher the better for both clubs. That's sounds like a simplistic statement, but it appears both teams have their franchise quarterbacks in place - or at least they hope so. Thus, getting a Top-5 pick or better could be an immediate boost to the future because it's expected to be a quarterback top-heavy draft. San Francisco and/or Chicago could trade away its Top-5 pick to a team desperate for a quarterback (Broncos, Jets, Giants to name three) for a haul of picks. San Francisco certainly won't be favored to win the rest of the way and maybe could catch winless Cleveland for the top pick. The Niners' remaining schedule is: at Houston, vs. Tennessee, vs. Jacksonville and at LA Rams. The Bears could really wreck their draft status by playing decent football over the next month. Obviously, this game is winnable. So is next Sunday at Cincinnati, Christmas Eve vs. Cleveland and, yes, New Year's Eve at Minnesota if the Vikings have their playoff seeding locked up by then. Chicago also visits Detroit, and that looks to be a loss. I'm sure I don't need to remind you that the Bears surprised everyone by trading a handful of picks to San Francisco to move up from No. 3 to No. 2 in last year's draft and take Mitchell Trubisky. The Niners liked him fine but weren't taking him No. 2. Now they can see him in person. San Francisco landed its likely QB of the future around Halloween in Patriots backup Jimmy Garoppolo. All it cost the Niners was a 2018 second-round pick, much less than the Bears paid the 49ers. Garoppolo was reportedly coveted by the Bears (before making the Trubisky move), and their fans really wanted him because he's from the area and played at Eastern Illinois. Garoppolo will make his first start in a Niners uniform and first since Week 2 last season with the Patriots. In a shocker, Coach Kyle Shanahan opted not to start Garoppolo out of the bye last week against Seattle. However, Jimmy G got into the game late when rookie C.J. Beathard was knocked out with an injury - in a poor taste, 49ers fans were cheering when Beathard was hurt because they wanted to see Garoppolo. He finished 2-for-2 for 18 yards and the team's only touchdown in a 24-13 loss to the Seahawks. In his brief career, he has completed 65 of his 96 passes for 708 yards with six touchdowns and no interceptions. Beathard suffered a bruise to his left knee and a hip strain, neither of which is considered serious. But perhaps those injuries were enough for Shanahan to announce Garoppolo as his Week 13 guy on Tuesday. It would have been unthinkable that the 49ers would not play their future in his hometown against a bad team (that he grew up rooting for). Beathard probably won't mind Sunday off considering he has been hit 52 times and sacked 19 times since being named the starter on Oct. 22. As for the Bears, that conservative franchise simply doesn't fire head coaches during the season, but I believe it's at least 50-50 that John Fox is gone on Monday if his club is embarrassed at home by a terrible 49ers team - by Garoppolo would simply make it worse. Plus, expect many, many empty seats at Soldier Field in moderate protest. That will get ownership's attention, and there's zero doubt Fox will be fired after the season. Last week, the Bears didn't belong on the same field as the Eagles in a 31-3 loss. Chicago had zero first-half first downs and finished the with six yards rushing and 140 total yards. Trubisky was overwhelmed, completing 17 of 33 for 147 yards and two picks. On the move, he has skills. In the pocket, he has been one of the most inaccurate passers in the NFL. It's still too early to tell what Trubisky truly is because his receiving group is awful, his offensive line below-average, and the play-calling unimaginative. Incidentally, last Sunday was the 11th time in Fox's three seasons the Bears have trailed by 21 points or more. That's more than one of every four games. They trailed by 21 points or more 14 times in nine seasons (144 regular-season games) under former coach Lovie Smith. At 5Dimes , Chicago is a 3.5-point favorite (-110) with a total of 40. On the moneyline, the Bears are -190 and 49ers +165. On the alternate lines, Chicago is -3 (-135) and -4 (-102). The 49ers are 5-6 against the spread (3-2 on road) and 5-6 "over/under" (2-3 on road). 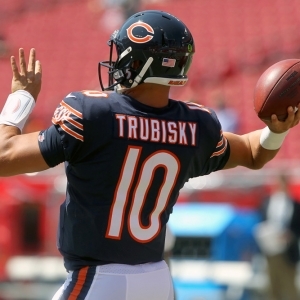 The Bears are 5-5-1 ATS (4-1-1 at home) and 4-7 O/U (2-4 at home). San Francisco is 1-6 ATS in its past seven in December. Chicago is 5-1 ATS in its past six after scoring less than 15 points in its previous game. The Bears are 1-9 ATS in their past 10 in Week 11. The under is 10-2 in the Niners' past 12 following a double-digit loss at home. The under is 8-3 in the Bears' past 11 following at ATS loss. Chicago is 0-6 straight up under Fox as a betting favorite, which is ridiculous. In Week 13 last year at Soldier Field, the Bears were a pick'em vs. the Niners and won 26-6 behind 117 yards and a career-high three touchdowns from Jordan Howard. It was a very forgettable day at quarterback on both sides as Matt Barkley started for Chicago, and both Blaine Gabbert and Colin Kaepernick played for the 49ers. They finished with six yards passing. Neither team completed a pass in the first quarter. This could be equally ugly. I prefer the under to the side here, but take the Bears and give the 3 points. It's simply a home-field call and I'll likely wait to give 2.5 instead.